05 Roush Sport with upgraded Roush wheels, cold air intake, and engine flash. 38,658 miles. Was daily driver for about 15 months and then has been garaged and driven sparingly since. Made a mistake before end of last winter and did not do a thourough wheel detail before it sat. 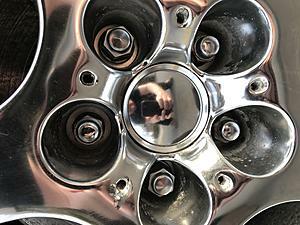 Now have corrosion on the small holes in the 05 roush chrome wheels. Pics below snd suggestions to stop/repair. Of the 4 wheels this one has the worst issue. Was an active member back in the day when i got my car. Recall that i placed or won one of the first ever photo contests that were held on the page. Had the Amrican flag beind the car. This place was always great! 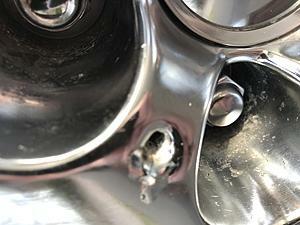 New ASA Chrome Wheel Corrosion.